You should not begin the Iron Hand training until you learn patience; your hand cannot be conditioned overnight! Meditation and chi kung exercises will help you achieve this. There are some Iron Hand techniques which are closely guarded secrets shown only to those involved in the actual training and who show superior moral character. Throughout the duration of training, one must always use “dit da jow” or Iron Hand liniment. This will keep the hands from becoming disfigured. The impact of continuously striking hand surfaces makes the blood stagnate, which in turn affects the vital organs and causes the hands to become permanently callused. This liniment is made in the traditional way by combining Chinese herbs with alcohol or vinegar and then letting the mixture soak for a period of a year or more. 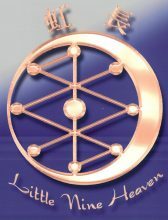 The Taoists believe in preserving the hands, not destroying them. If the liniment is not used, there is the risk of internal hemorrhaging and severe arthritis in the hands. Many practitioners have ruined their hands for life by neglecting to use the liniment on a consistent basis. With the ease of access to firearms and other weapons, the martial aspects of the Iron Hand may now seem obsolete. However, the sense of accomplishment and self-confidence that proficiency in this art can bring is second to none. If done correctly and for a sufficient period of time, the Iron Hand training will help you develop exceptional strength and power in your hands and body. It will also greatly enhance and develop the sensitivity of your hands and their ability to transmit energy for the purposes of healing and giving pleasure. While the focus of this training is on the hands, the entire body, the mind, and the chi must be conditioned and developed if maximum power is to be achieved. A powerful grip complements and enhances Iron Hand training. Several exercises improve grip strength, including simple push ups. Do them on the knuckles and the finger tips starting with five fingers and gradually decreasing to one. Another good drill is to hang from a tree limb and swing for as long as you can. If you don’t have a tree available, you can hang from the top of a door. Another grip-strengthening exercise, one that is very traditional, is to fill a jar with sand and carry it around as long as you can. The jar’s mouth should be narrow enough for you to grip with your fingertips, yet wide enough so that your hands are stretched. Increase the length of time every day, then add more sand and start over. Before and after the Iron Hand training, it is necessary to do a breathing exercise that will put energy into the hands and make them stronger. 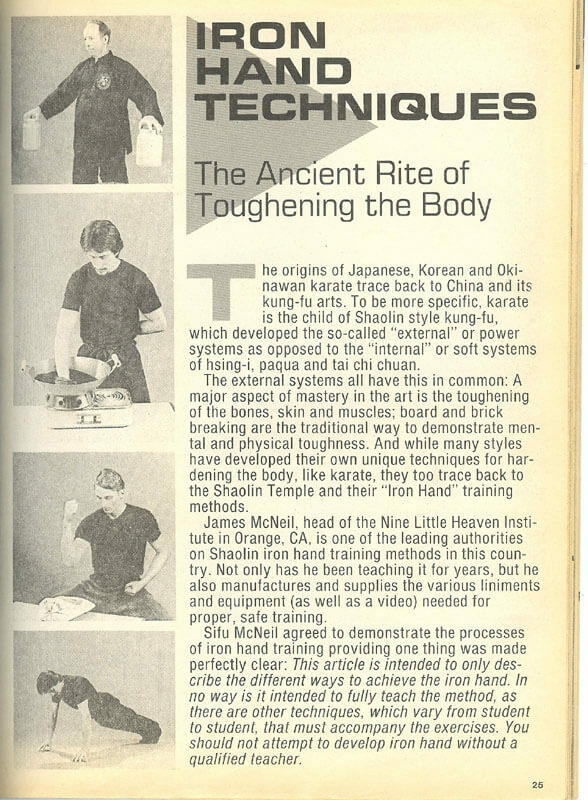 A true Iron Hand practitioner or chi kung instructor should be able to put energy into any part of his or her body at will. 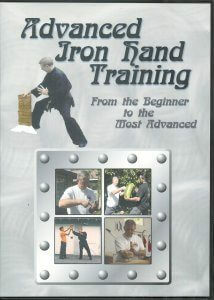 Advanced levels of Iron Hand training entail learning how to penetrate the skin of a human or animal. In the old days, slaves were used as guinea pigs. However, since this barbaric practice is no longer acceptable, a large barrel is used with a piece of leather stretched across the top. Inside is a tomato or other soft fruit. The practitioner must penetrate the skin and grab the tomato without damaging the fruit. His hand must be solid then soft with feeling. All of this must be done with lightning speed. + In a breaking demonstration, are spacers being used between slabs? The use of spacers will make breaking a stack of bricks, tiles, or ice considerably easier; the first slab will break the second, the second will break the third and so on. + A large slab may look impressive, but is actually much easier to break than a smaller, more compact version. If more then one item is broken from being held is there a slight gap between them? In either case if even a millimeter gap is there then the break is being largely done by the slab/brick colliding with the supporting surface/other brick and not the strike. + Hitting a sheet of ice will shatter on impact. If it makes a clean break, you will know that it was pre-cut then frozen again. Like anything worthwhile, mastering these Iron Hand techniques will only come through intense hard work and dedication to training. But if you are willing to pay the price, the rewards will be beyond your wildest dreams. It is very important that Iron Hand methods are learnt from a qualified teacher. I still train after more that 35 years of practice and my hands are still soft and without calluses or arthritis.